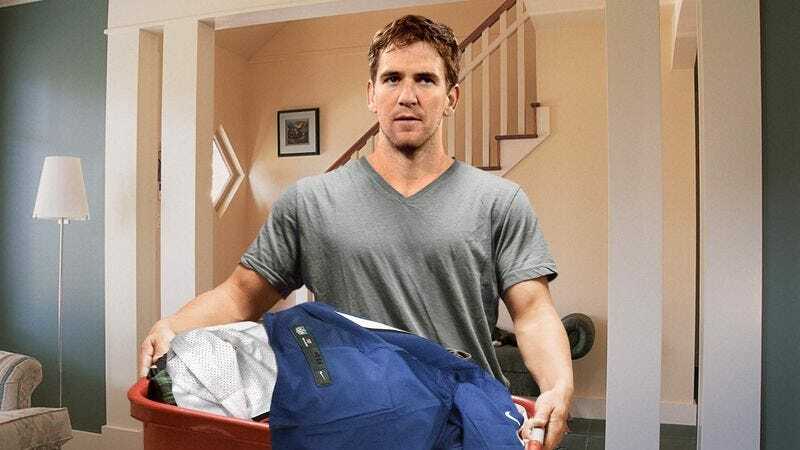 NEW ORLEANS—Retrieving a duffel bag full of his stained, fetid clothing from his trunk, New York Giants quarterback Eli Manning dropped off all of his dirty game-day uniforms at his parents’ house Monday to be cleaned for the following week. “I usually stop at home once a week with all my dirty clothes from football, and then my mom washes and folds everything for me,” said Manning, adding that his mother makes sure he has enough clean socks to wear until his next visit. “I tried doing it myself my rookie year, but I accidentally bleached my home jersey, so I just have my mom do it since she knows about all the temperature settings on the washer and the right detergents to use and all that stuff. And before I leave, she always packs a bunch of frozen home-cooked meals for my road games. It’s great.” Manning added that if he is lucky, his parents will treat him to dinner at the local Texas Roadhouse before he heads home.